In this tutorial, we'll step through the process of authenticating, adding participants, and sending an instant message. Before we can add participants to the conversation or send a message, we need to start the chatService. This is achieved by the rather verbose call to the chatService.start() method. We'll add error checking to ensure that if it fails we are notified accordingly. 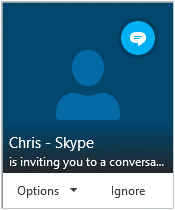 A Participant is simply a member of the conversation - another Lync or Skype for Business user. One or more participants must be added to the conversation before an Instant Message can be sent, otherwise you'll really just be chatting to yourself. 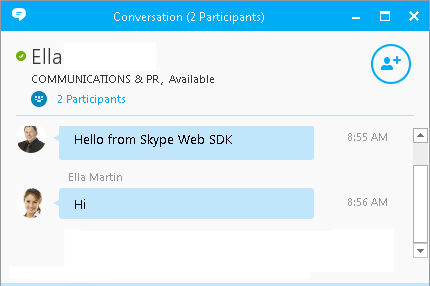 A participant is represented by their SIP address, which is typically their email address in most Lync and Skype environments. Once a participant has been added, an Accept Message dialog box will appear on their computer - such as the one shown here. Assuming they accept the invitation to join the conversation, you can then send a message. If the participant ignores or declines the invitation, an error is thrown, and they will not receive any Instant Messages. Now that you have one or more participants in your conversation, you can send an Instant Message using the .sendMessage() method. This method simply accepts a string, and passes it to the SDK, which then attempts to deliver it to all participants. Once we have finished sending Instant Messages, we simply need to stop the chatService, using the .stop() method.